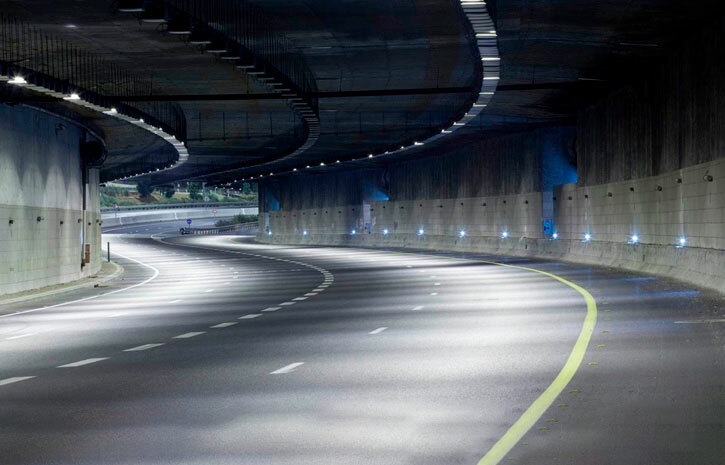 Tunnels can be found everywhere these days and no matter what they are used for they lack natural light and therefore need effective lighting solutions. To provide safe passage from one end to the other sufficient illuminance levels must be achieved day and night, throughout the year. Sudden variations in lighting levels when entering or exiting a tunnel are not allowed. At night the lighting levels must be dimmer, while during the day they need to be multiplied and concentrated more at the tunnel entrance. Luminance and illuminance levels, glare and light uniformity all play a big role when designing the luminaires for this purpose as they affect people’s safety. Public transport – trains, trams, boats – as well as stations and harbours have their own lighting requirements and must follow national and industry standards. LEDs have a long lifetime, low maintenance needs and consume less power. This is especially important when projects are bigger and cover a wide geographic area. For transportation solutions the LED’s small size allows freedom of design and the possibility to reduce energy consumption.